You might be wondering: Who even buys Android tablets anymore? The answer, Samsung seems to think, is people who want not just an excellent canvas for multimedia but the multitasking prowess of a laptop without the extra heft. 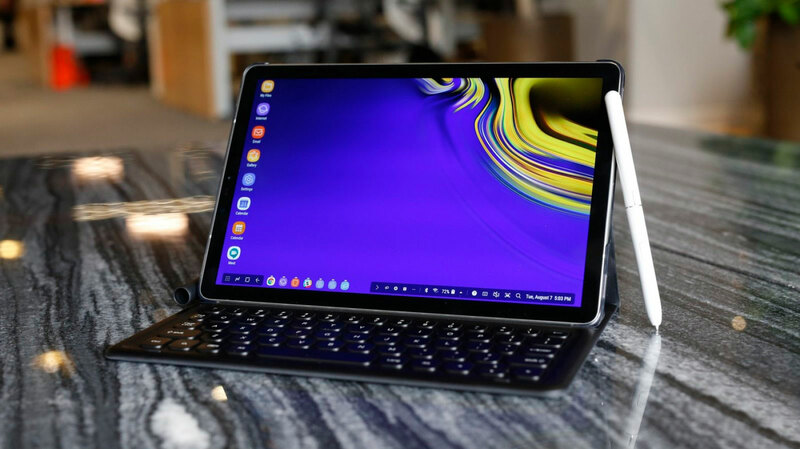 The Galaxy Tab S4 was designed to be a workhorse, featuring a desktop-like mode called DeX that sits on top of Android. It's supposed to provide a more familiar interface for being productive while maintaining the great entertainment experience Samsung's premium slates are known for. The tablet also comes with an S Pen so you can mark up notes or sketch caricatures on the go. But really, the main purpose of the Tab S4 is to help you get work done. The trouble is, that is the one situation where you just can't rely on it. How would you rate the Galaxy Tab S4? In theory, DeX mode on a tablet is a promising idea. It was introduced alongside a dock accessory for the Galaxy S8 that turned the Android phone into a PC-like machine. You could use the dock to hook up a keyboard, mouse and monitor, essentially using it to power a full-desktop experience. On the Tab S4, DeX is simply a software mode that you can flip on and off through the quick-settings panel or the task bar. And it makes much more sense here, because you don't have to connect a larger screen to multitask. DeX mode puts a desktop-like interface on the tablet, complete with a taskbar, a systems-indicator tray and a dedicated home screen you can stick shortcut icons on -- just like on Windows or Chrome OS. You can even run as many as 20 resizable windows at the same time. Any Android app can be launched in this environment, which is nice, but not all of them are optimized for it. And, in general, the execution is severely lacking. Many things behave weirdly in Dex mode. For example, opening a blank document from Google Drive in Chrome launches the Doc app, but just displays an error message. Samsung's own browser can handle that, but in some other instances, like trying to view your Google calendar in your browser (if you don't want to go to the trouble of installing the app), Chrome is more suited. Samsung's browser just showed the mobile version of your day's events instead. Also, security certificates can't be installed or verified sometimes, and occasionally my Slack notifications didn't show up. It's all very finicky and feels unfinished -- it's nearly impossible to predict what will work and how in DeX mode. The desktop environment works better with peripherals like a keyboard, a mouse and an external display. And I highly recommend connecting a Bluetooth mouse, because using your fingers or stylus to highlight words or make precise adjustments on the Tab S4 is a giant pain. You can use your own keyboard or spring $150 for Samsung's version, but that would be a terrible decision. I typed part of this review in the back of a cab, and Samsung's cover was surprisingly sturdy, keeping the tablet propped up nicely throughout the ride. But the cramped keyboard really isn't ideal for getting any serious work done. It's helpful for firing off quick emails, texts or tweets, but the undersized keys make typing quickly or accurately a chore. Plus, not all keyboard shortcuts behave as you'd expect -- Control+arrow key doesn't always jump to the next word in a document, it switches to the last tab in a browser instead. If you want to finish an essay or business proposal, you're better off on a proper laptop. The keys themselves are responsive, comfortable and feel satisfyingly clicky, but a few of them are redundant. To the left of the spacebar is a toggle that brings up the onscreen keyboard. Why a physical keyboard needs a key dedicated to bringing up a virtual one is beyond me. Meanwhile, on the spacebar's right sits a button for changing your keyboard language, which even a multilingual person like me finds useless. Worse, holding down shift and space does the exact same thing -- which was really annoying when I was typing in all caps (in an email for emphasis) and kept bringing up the language indicator instead of inserting spaces. Why do you need two whole shortcuts devoted to the very specific task of changing keyboard language? I'd much rather a second Control button, which would make hitting shortcuts easier. It's also mind-boggling to me that Samsung has no All Apps button here. Instead, there's a search key (which sort of serves as the Apps shortcut). The good news is, you don't have to get Samsung's keyboard. Save yourself some money (and frustration) and get something else. I connected an iMac keyboard, which offered much better spacing and therefore more-accurate typing. But be warned that the shortcuts are still just as quirky. There's a lot I hate about the Tab S4 (particularly DeX mode), but it has its redeeming qualities. Samsung generously includes the S Pen, which has a more-rounded design this year. It enables tools you'll also find on the Note phones, like Air Command, Translate and Screen Write. There's also the Live Message feature, which debuted on the Galaxy Note 8 -- it's cute but not very useful. I did enjoy the stylus, which was as responsive and fine-nibbed as I needed it to be as I uncovered my hidden artistic talent and specialty for still lifes of cleaning products. I also liked the 10.5-inch screen here -- it's vibrant, sharp and bright enough to read under direct sunlight. Despite increasing the display size from last year's Tab S3, Samsung managed to retain a relatively dainty footprint. The tablet features Intelligent Scan as well, which mixes facial recognition and iris detection for faster logins. This conveniently works in landscape mode, although not very consistently, and I almost always chose to enter my PIN instead. The tablet's Snapdragon 835 CPU held up well -- I didn't have any major hiccups switching between apps or finishing a document with a video playing in the background, although the system has crashed once so far. I don't really know what caused it -- I was typing up a script and trying to switch apps with the Alt-Tab shortcut, which might have confused or overwhelmed the device. The Tab S4 would benefit from having more than the meager 4GB of RAM onboard. I was also surprised to see that despite packing in a larger 7,300mAh battery, the Tab S4 didn't last much longer than the Tab S3. On our video test, the S4 came in at almost the same 12-hour mark as its predecessor. In the real world, though, the battery dropped 20 percent in less than two hours when I was working in DeX mode. For a $650 tablet, I expect better. If you want a dainty 10-inch tablet-ish device for actually getting work done, there is a variety of alternatives. Consider the Surface Go, for instance. It has a gorgeous display, a built-in kickstand and runs full Windows (if you install the free upgrade). Microsoft's companion keyboard cover for the Go is much better than Samsung's atrocious counterpart, too. And the best part: The Surface starts at just $399. To be fair, the Tab S4 lasts longer and comes with the S Pen, whereas you'll have to spring $100 extra for Microsoft's stylus. There's also the iPad Pro, which starts at the same price as the Tab S4. While I'm not a fan of Apple's keyboard cover either, and iOS isn't as good for multitasking as a desktop, at least it's not unpredictable. All told, the Tab S4 has a unique set of features making it difficult to find a perfect alternative, so if you really must have a stylus and a desktop-like mode with Android apps, then, by all means, spend the $650 on it. Almost anyone else would be better served by one of the above alternatives, though. The Tab S4 suffers from a problematic premise. If Samsung didn't insist that it was designed for getting serious work done, I'd be more forgiving. DeX mode is simply too unreliable for any regular use. Many of my problems had to do with the companion keyboard, but a lot of the fault here lies in the software as well. Some of the inconsistencies are due to Samsung's desire to keep Android as its base instead of, say, Chrome OS. As an Android tablet alone, the Tab S4 is actually pretty good. It has a good screen, decent audio and respectable performance. But like the Tab S3, the Tab S4 isn't special enough to justify its high price. Samsung's efforts at creating a sleek machine for multitasking on the go is laudable, but DeX mode's inconsistencies make it more a nightmare than a dream come true.